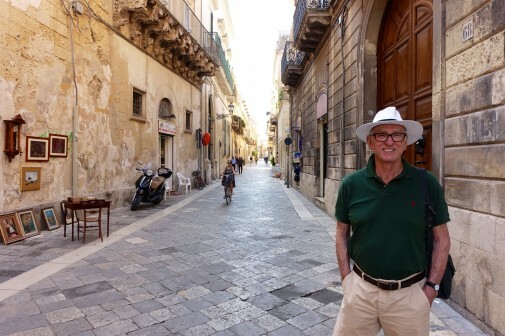 My idea of days exploring the 17th century city of Lecce in Puglia, located in the heel of the Italian boot, with its buildings all built from pietra lecese, the creamy white local limestonetakes only a couple of hours in reality. 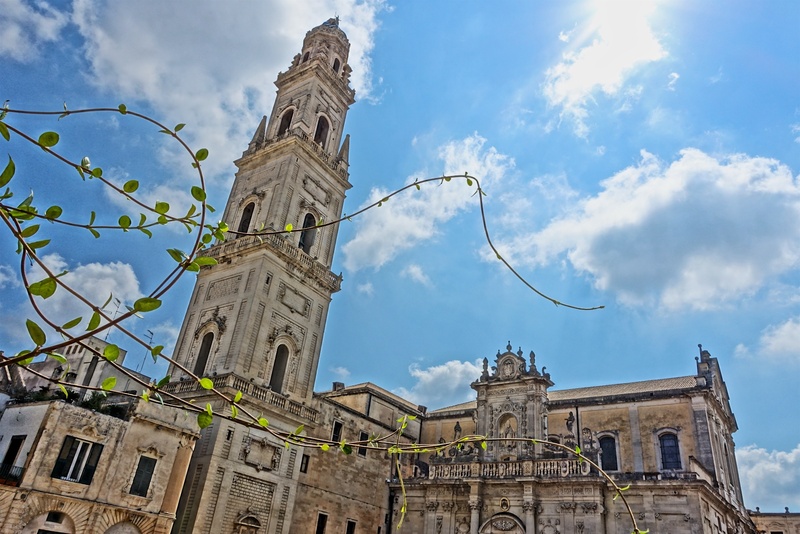 In Piazza del Duomo in Lecce, alongside a tall, tapering bell tower, the city’s 17th-century highly-chiseled Baroque edifice - the Duomo with a Greek marble altar decorated with lapis lazuli. idding arewell to Rome after a short meet-up with Mark and Jenny, we drive for five hours south towards the ‘heel of the boot’ of Italy. We arrive in Basilicata without a hitch (and driver Paul without shoes! 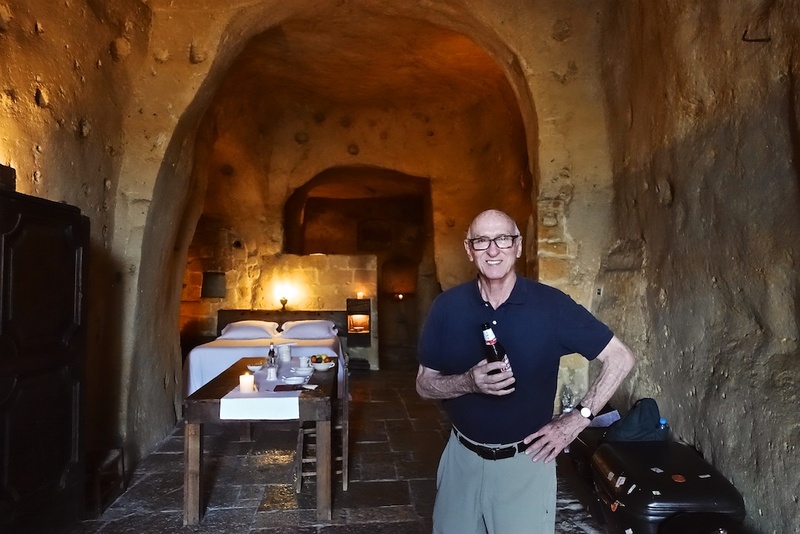 ), only to be get lost in the narrow streets of the ‘Sassi’ area of Matera where we’re staying the night – in a cave. 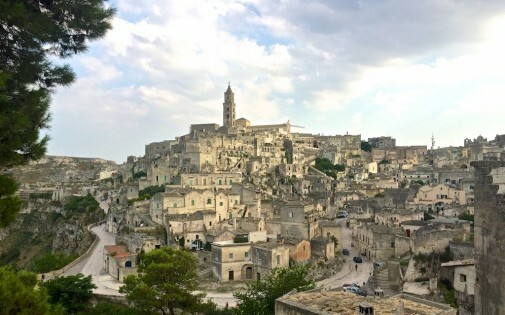 Matera, in Basilicata, has a unique legacy that frames a remarkable setting of almost 10,000 years of continuous human occupation. 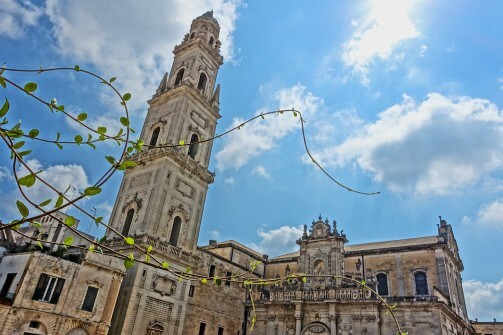 Here, the history of urban ecology, from sustainability to squalor, inspired UNESCO to designate a World Heritage Site, while its old Jerusalem-like aura captured several movie directors, including Mel Gibson, who used Matera to film ‘The Passion of the Christ’. In fading light, our first sighting of the ‘sassi’ areas built on the sides of the gorge (and where our hotel is located) is stunning. This is the scene that stops us in our tracks as we navigated through the winding streets of the Sassi area trying to find our hotel. 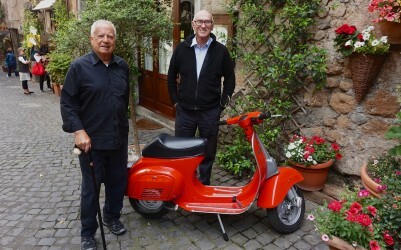 Winding down into the gorge we finally find our hotel, the 18-room Albergo Sextantio Le Grotte Della Civita. A porter comes to lug my luggage up the stone steps, but Paul (with one carry-on for the whole month away!) looks after his own. 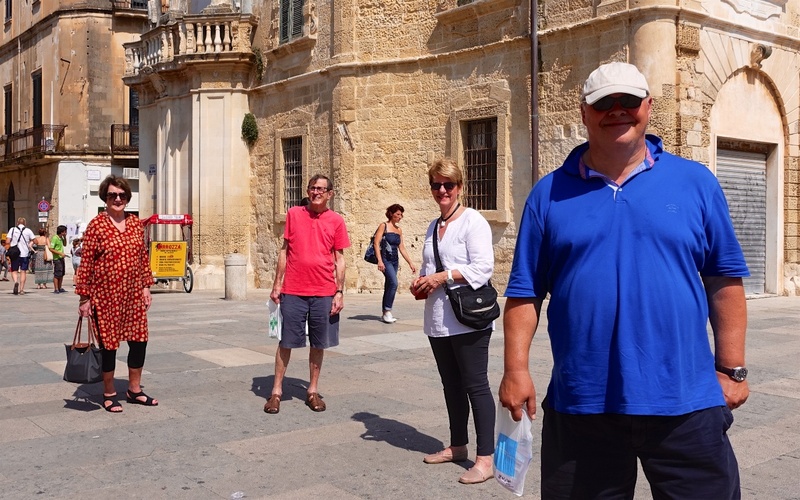 We join cave dwellers from millennia before in the same caves for an overnight experience – and for a guided tour of the area to better understand the patrimony. e sleep in a cave with a door to the light, but bathe in a candlelit third cave deeper into the limestone mountain. 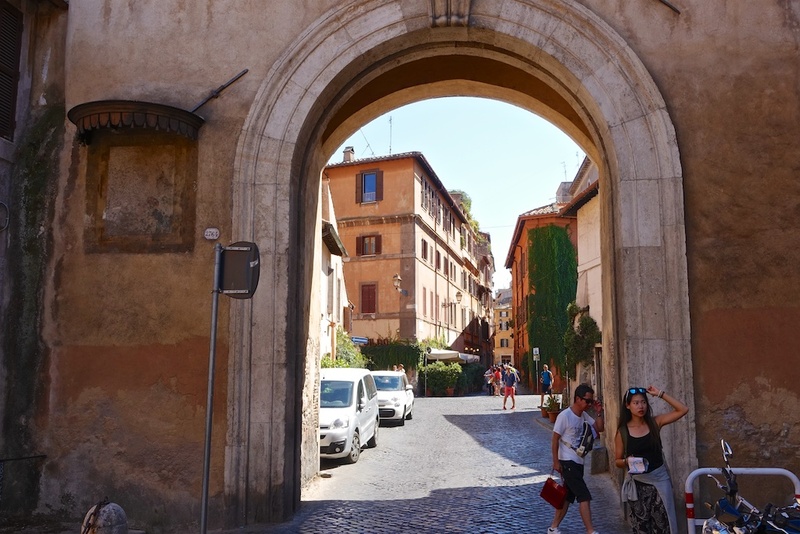 fter the long flight from Singapore, out for a walk late on a Roman Summer afternoon, I pause . . . and enjoy watching kids chasing bubbles in Piazza del Popolo. ROME . . . 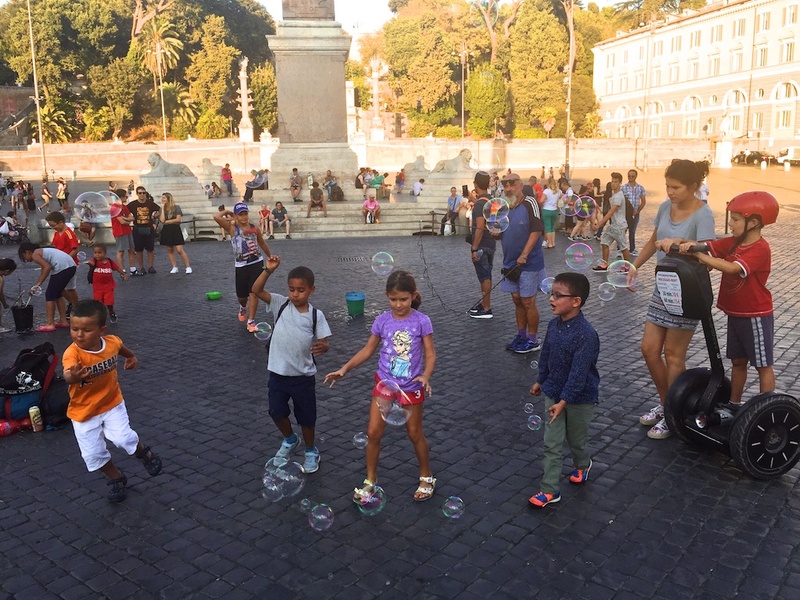 In Piazza del Popolo . . . out walking, late on a Roman Summer afternoon. ext day, Paul arrives and it’s time to address both body and soul. izza and cold beer in Trastevere sates the hunger on a very hot Roman summer’s day, but we suffer an even hotter one as we set out on pilgrimage along the Tiber on our way to St Peter’s to ‘salve the soul’. 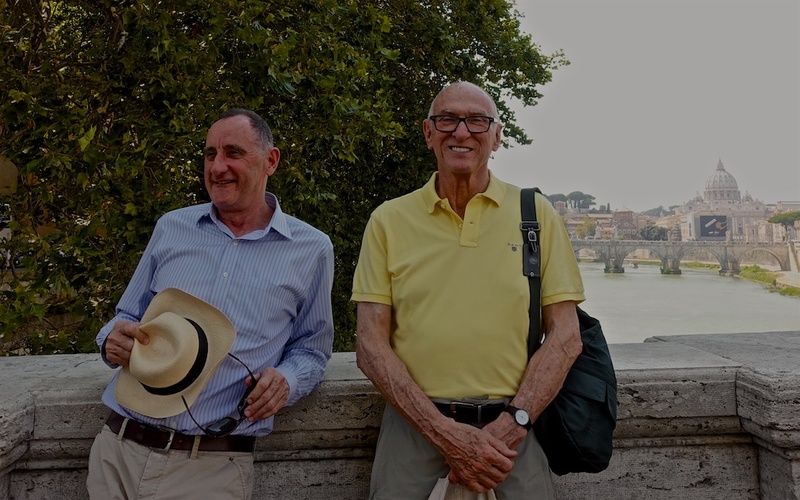 In order to gain our plenary indulgence, we make find the church of San Salvatore in Lauro, one of three designated by Pope Francis for the “Jubilee Year of Mercy”. A prayer at a side altar dedicated to the soon-to-be-canonised Mother Teresa, before crossing the Tiber to Castel Sant’Angelo for the walk up the Via Conciliazione to St Peter’s. We join the queue for security check before following other pilgrims into the Basilica through the Holy Door to receive Reconciliation, and our indulgences. y brother Mark and Jenny land in Rome after their 28-hour marathon from Brisbane via Cairns and Hong Kong on Cathay Pacific, so it’s great to catch-up. 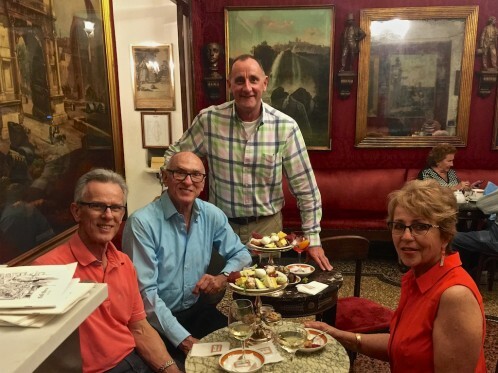 Another late afternoon walk, this time to Caffè Greco on Rome’s Via Condotti where Keats & Byron also drank at the marble tables of this celebrated, richly-ornate 18th-century cafe. 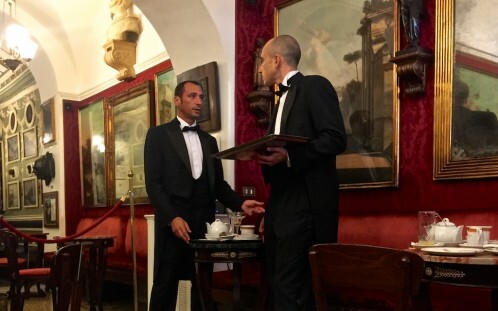 Liveried waiters at Caffè Greco on Rome's Via Condotti where Keats & Byron drank coffee at the marble tables of this celebrated, richly-ornate 18th-century cafe. CAPTIONS – click on the first photo –> then click on ‘i’ icon in upper right corner. I’m on my way to Italy! 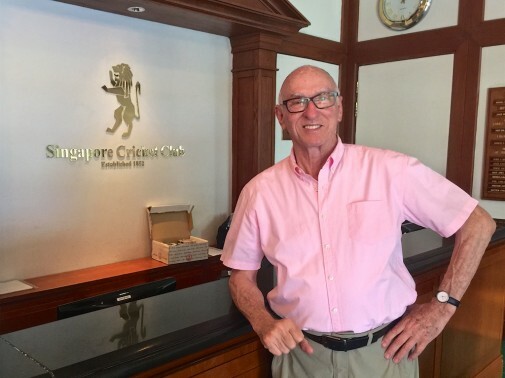 n the stopover in Singapore for a night at the Shangri La Hotel (where I first stayed 40+ years ago), I get the chance to catch-up with good friends, Joy Wrix and Alex, who sign me in me to the hallowed surrounds of the old Singapore Cricket Club for lunch. 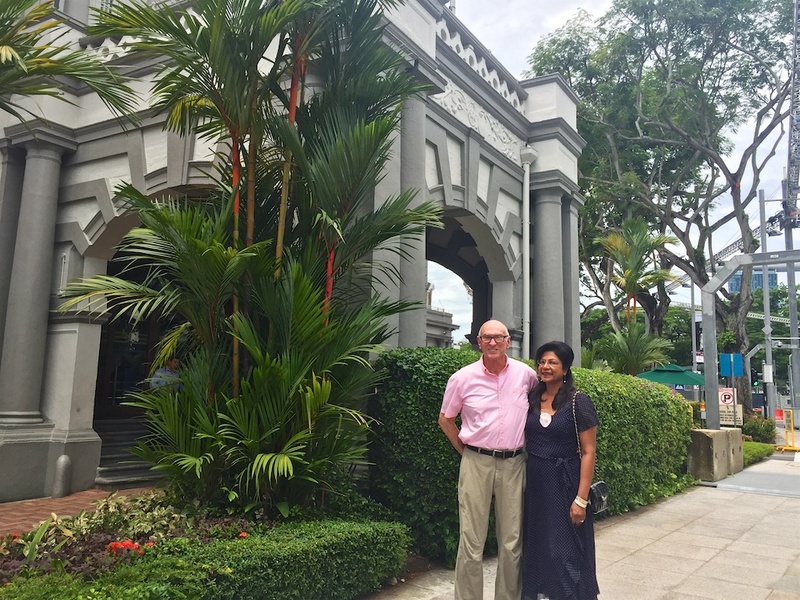 Time for some excellent local chicken satay and Hainan pork in the once men-only dining area – before coffee and cake on the verandah overlooking the Padang where cricket has been played since British colonial times. Is it any wonder that today most of the active members of the club are cricket-mad Indians? The casual dining experience is momentarily dramatised when unwittingly I break a major house rule by answering my ringing mobile phone. Joy placates the dining room captain who eventually stops waving his arms in the air at my transgression. Now for perhaps my favourite airline experience on SWISS International to Zurich and Rome. An aura of formality still remains in the bones of the wonderful old clubhouse but jackets and ties are no longer 'de rigeur'. 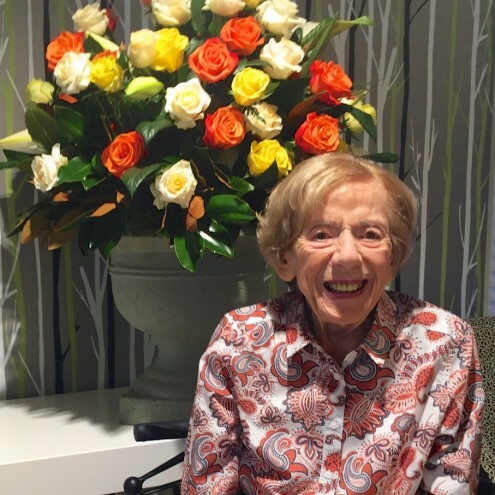 he Brisbane ‘Mussies’, as Uncle John Cliffe used to call us, came to Sydney for the Big 100 Celebration of Aunty Beth with members of the Evelyn Scott families, and of course ‘The Wards’! To view captions, click on the fist photo and in upper right corner click on ‘i’ icon. ith birds on the balcony for breakfast, it’s impossible to get a word in edge ways about the plans for Sydney over the next couple of weeks with my newly arrived visitors from Miami – Michael and Ricardo. Lorikeets have flown in and captured their full attention! 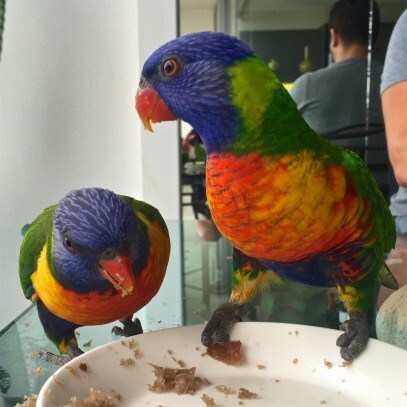 What visitor wouldn't be captivated (and ignore my discussion of trip plans) by such beauty of these lorikeets! 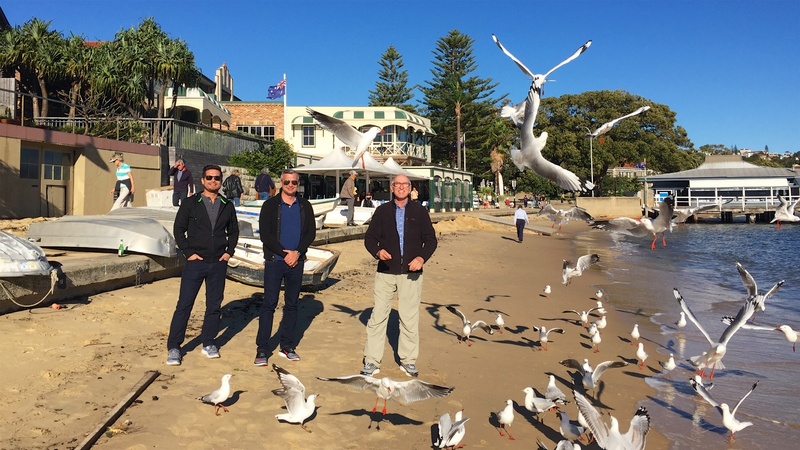 On the beach at Watson’s Bay, slowly recovering from the battering of the storms that hit the whole east coast of Australia last week, two friendly Chinese tourists gesture to us to accept a handful of chips to throw to seagulls sitting on the beach to get them to fly into a frenzy. And success! The photo is testament to Michael being gleefully happy with the ‘chip-throwing’ exercise – with Ricardo and Michael Iñesta also amused. The whole first day of the visitors stay was obviously ‘for the birds’! 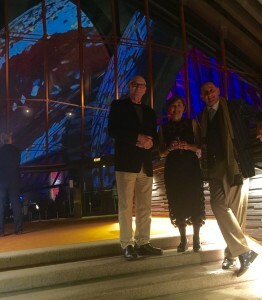 At a Reception in Bennelong Restaurant tonight to mark the opening of Songlines – the first Indigenous lighting of the sails on Sydney Opera House – Paul O’Donnell and I agree that in our childhood experience, the whole ‘Aboriginal’ phenomenon was mute. It’s striking here in 2016; here on this site of Tubowgule – ’where the knowledge waters meet’ – the salt and the fresh, that the meaning of being a contemporary Australian has new life breathed into it from this ancient tradition. 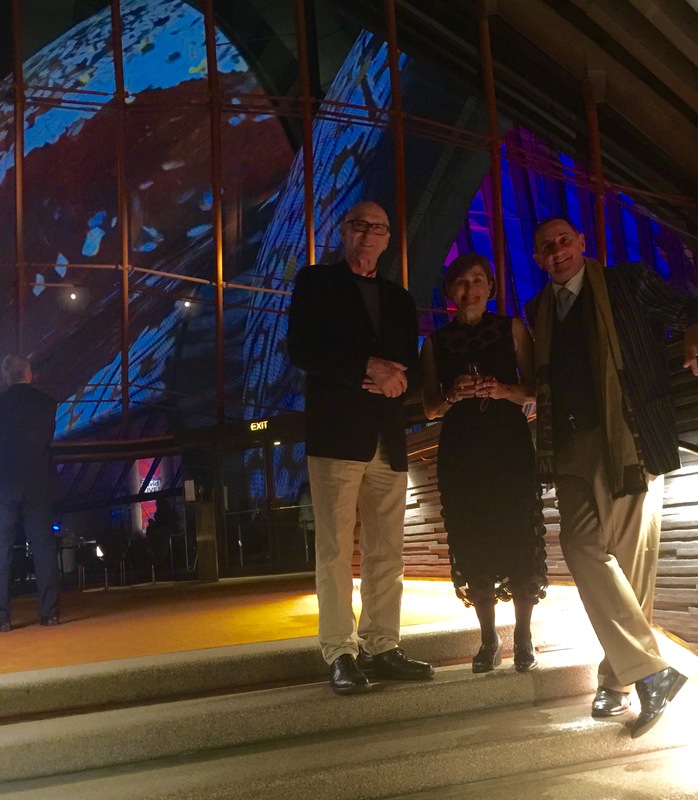 The Songlines are beautifully projected on the sails of the Sydney Opera House for Sydney-siders, visitors, and the whole world to see. Opera House CEO Louise Herron told the gathering it is the largest live event thus far on Facebook Australia. 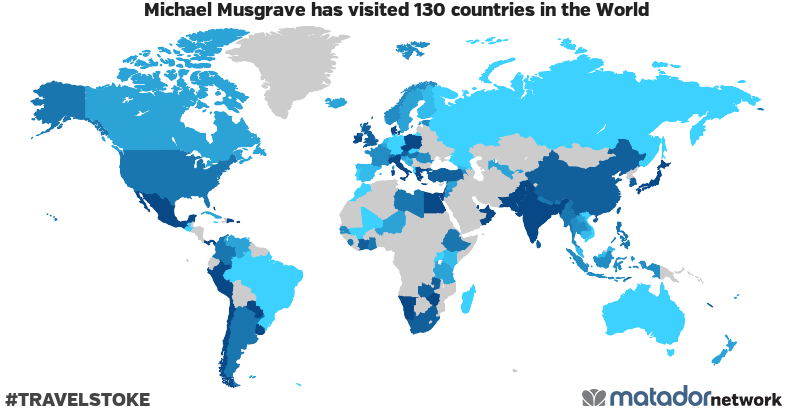 “when I’m away from country something is missing inside. It’s the breathing part of my body, that makes my spirit feel alive”. 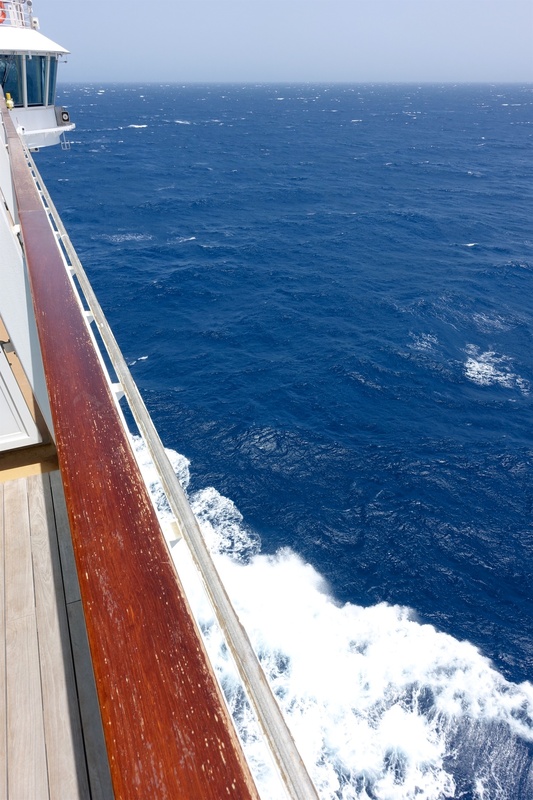 At the end of any cruise, there’s always a ‘collection’ of ship shots. No story line, but always a good ‘memento’ of the occasion. 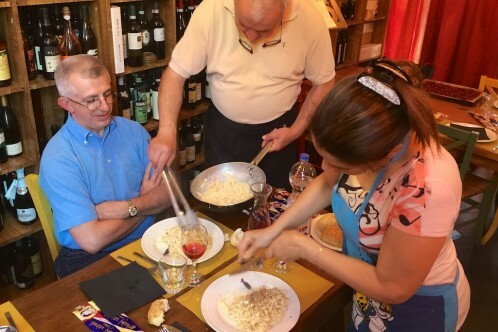 hunch prompts Agostino to drive off the expressway into the parking lot of a soul-less shopping centre in the middle of rice fields in the plains of Lombardy feeling that he might just find a traditional Italian restaurant tucked away. And yes, a stand-alone, seemingly ramshackle building emerges behind rows of parked cars. We are met by a smiling Giovanni with hand outstretched, owner of ‘I Templari’, (named after a medieval church managed by the Templars). He’s quick to tell me that his father once lived in Ayr in North Queensland and he has a cousin who is a barber in Sydney. Instant family! Seating us in the family dining room (with the airconditioning), he proceeds to organise the meal; home-made tagliatelle with grated white truffles served on a plate of fresh mint leaves, lavender flower and grated parmesan ; enough to blow the senses (not to mention the budget). A chilled local Rosé is refreshing, even if a bit rough. I really don’t need the slow-cooked beef with herbs inside and a fresh pepperonata (capsicum and tomato sauce) that simply appears for us to share; but what can I say, or do? This is family! Home-made tagliatelle with grated white truffles served on a plate of fresh mint leaves, lavender flower and grated parmesan - enough to blow the senses (not to mention the budget). The bill for the whole meal – the princely sum of €40 for the two of us! And there is no saying ‘no’ to the homemade dessert – pastiera Napoletana, with ricotta, vanilla and candied fruit. The bill – the princely sum of €40 for the two of us! he three-week cruise from Dubai through the Suez Canal and across the Med to Monte Carlo is already a distant memory! 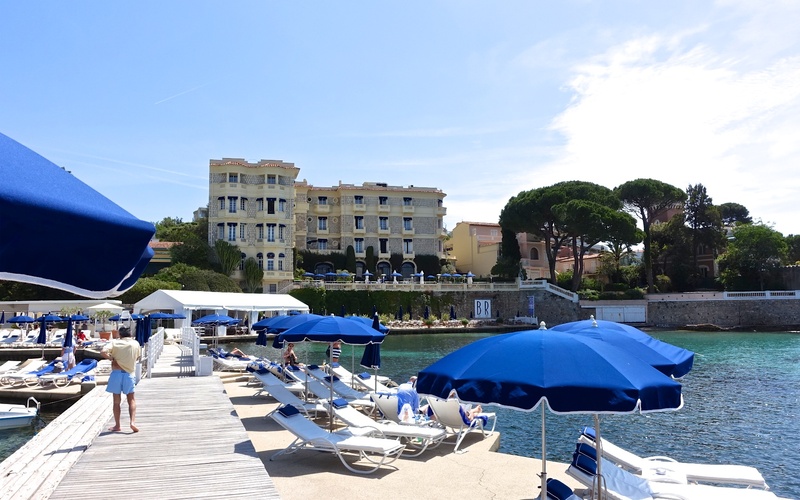 I’m staying at the Hotel Belles-Rives in Juan-Les Pins with sweeping sea views from what was once the Art Deco mansion of F Scott Fitzgerald, (the American novelist and writer of The Great Gatsby’). Sitting under an umbrella on the terrace with waters lapping at my feet, I take on the ‘Riviera ambience’ of this place and enjoy a simple Salade Niçoise. I could spend a week here and never leave the property. The Art Deco Hôtel Belles-Rives in Juan-Les Pins, once the Art Deco mansion of F Scott Fitzgerald, (the American novelist and writer of The Great Gatsby’). 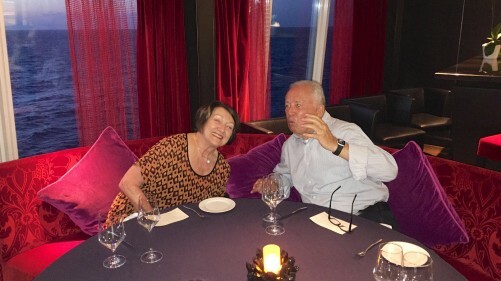 Re-creating my own heady days of the mid-70’s, when working for Amex and flying to exotic places for meetings at the drop of a hat, I decide to return to the small hill town of St-Paul de Vence, just as I did with June Whelan in 1976. I recall choosing a convertible from Avis and driving on the ‘wrong’ side of the road for the first time in my life, and with no fear. (I don’t know about June!) We had lunch on the terrace of La Colombe d’Or. This deserted medieval hill town was brought back to life by artists before the Second World War (lead by Marc Chagall), and today, artists continue to thrive and breathe life into the many colourful studios, shops and gardens dotted through the winding narrow streets. Wandering, we come across La Chapelle des Pénitents Blancs, decorated by Belgian artist Folon. It exudes such light and an instant sense of peace. In this small chapel, Folon has created a fairytale world, a blend of weightlessness, transparency and harmonious gradations of colour to arouse the imagination. Coincidentally, the artist was also a friend of the owners of the Colombe D’Or where June and I lunched forty years ago. The restaurant sign that he painted (in similar gradations of colour) still hangs outside today. 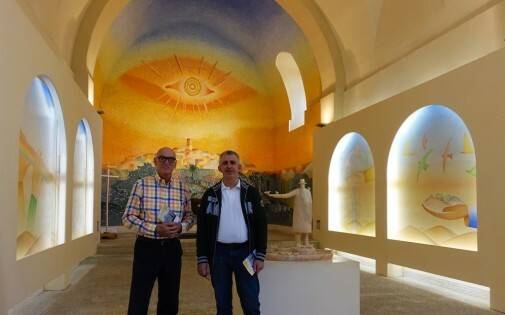 In St Paul de Vence, Michael and Agostino wander into La Chapelle des Pénitents Blancs, decorated by Belgian artist Folon. It exudes such light and an instant sense of peace. For lunch, we decide to follow the valley of the River Loup down through the mountains ending up at Pont du Loup. This pretty place used to be a fashionable country resort at the end of the 19th century where Queen Victoria would visit by train from Nice to lunch on fresh river trout. The cafe where we stop for a late lunch today is far from fashionable but the trout is fresh and sweet. 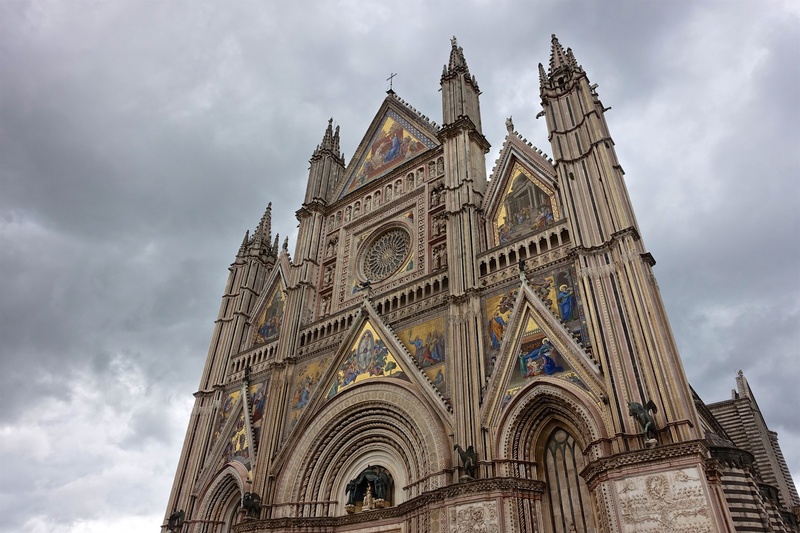 e decide to give Rome a miss today and head north east from the port of Civitavecchia to the Italian hilltop town of Orvieto in Umbria. I want to revisit the brilliantly coloured chapel of St Brizio in the Cathedral (more correctly the Capella della Madonna di San Brizio) – famous for the fresco cycle by Luca Signorelli (painted 1499 – 1503) depicting visions of paradise, hell and the end of the world; and then take time to enjoy lunch in the countryside. Rather than disappoint, grey skies present another perspective, favourable, in which to view the golden mosaics that adorn the facade of the 14th century Cathedral. Regrettably, a change of lighting, (and not for the better), along with some deterioration of colour in the frescoes in the St Brizio chapel is a disappointment this time. 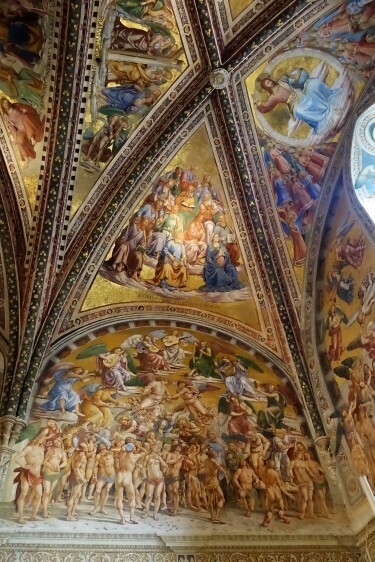 The Luca Signorelli St Brizio Chapel in the Cathedral of the Assumption in Orvieto. Many of the people going there in the 1500s would have believed that the end of the world and the day of judgement were due at any moment. Talk about a fear driven religion - or was it just that Signorelli liked painting naked male bodies? 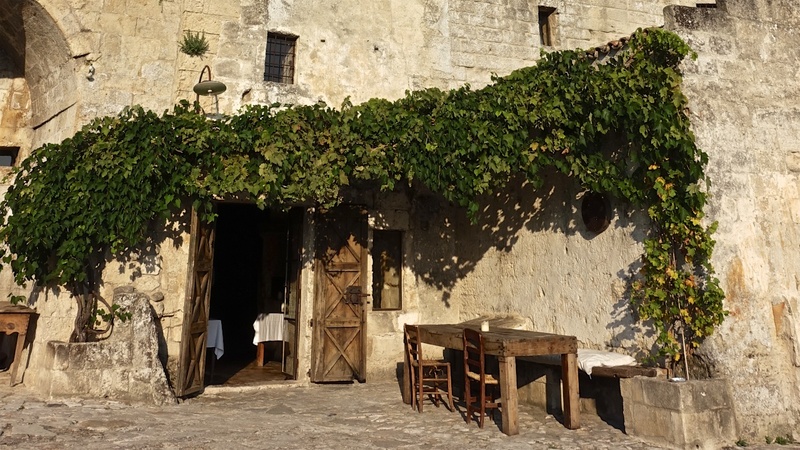 Enrico recommended Restaurant Altarocca, offering organic products from their own farm – a selection of local cured meats and home made marinated salmon caught in local streams. Maccheroncelli with pepper and ewe’s cheese and seasoned pork cheek made for a wonderful pasta dish. 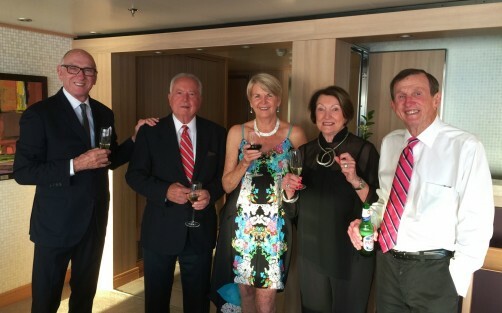 The vino was from their own vineyard, a soft Orvieto white. Couldn't pass-up this very 'Roman Holiday' photo opp. his morning, turning north, we head up through the straits of Messina towards Civitivecchia and Monte Carlo. 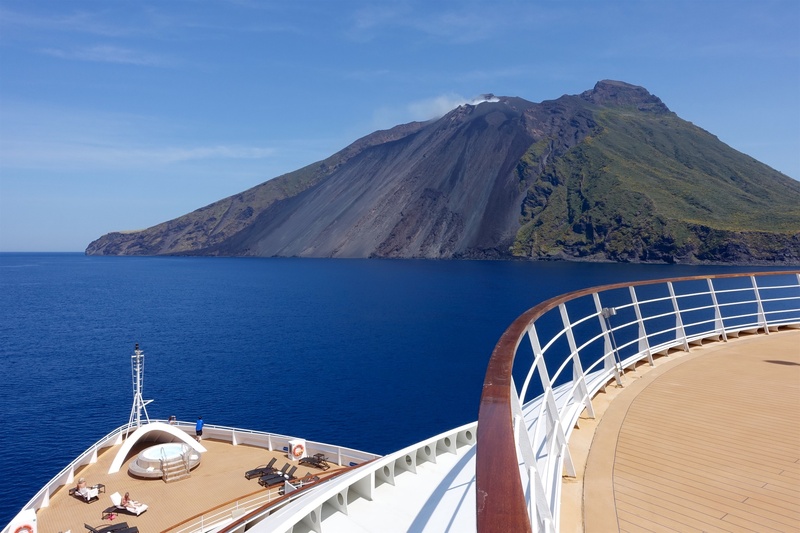 Calabria in the toe of Italy lies to the east, and the island of Sicily to the west; dolphins play alongside the ship in our wash.
After lunch we sail around Mt Stromboli, a small island in the Tyrrhenian Sea, off the north coast of Sicily, 926 metres above sea level. It contains one of the three active volcanoes in Italy that’s conveniently ‘smoking’ for us. n interesting morning around Capernaum on the northern side of the Sea of Galilee where Jesus spent the three years of his public ministry. The town of Capernaum – “He left Nazareth and made his home in Capernaum by the lake”. 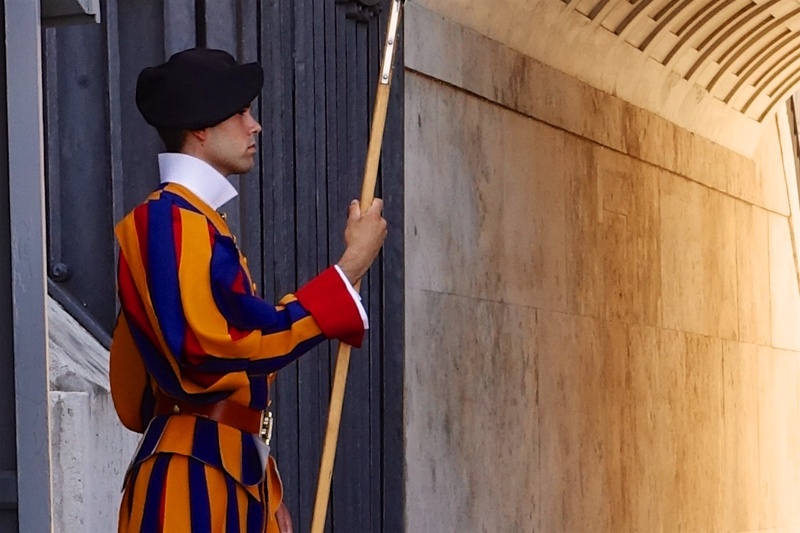 “On leaving the synagogue he entered the house of Peter and Andrew with James and John”. A little further around the lake, a small Franciscan chapel stands on the spot where Jesus appeared to his disciples for the third time after the Resurrection, and where he afterwards reinstated Peter with the words “feed my sheep”. A pretty apt finish not only for this short visit, but for this broken world we’re living in. 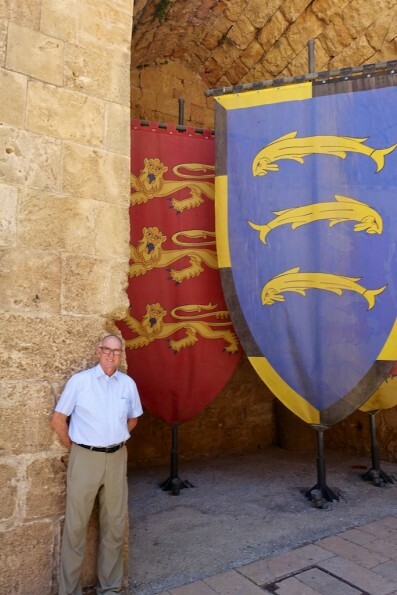 fter visiting Christian sites on the Sea of Galilee, we drive across the north of Israel to Acre (commonly known as Akka), on the northern extremity of Haifa Bay to visit the excavations in the Hospitalier Compound – the old Crusaders fortress. After expelling the Crusaders from the Holy Land on more than one occasion, the Muslims filled in the fortress with sand. The Ottomans built their fortess on top of it. It was only on the 1960’s that Israeli archaeologists started the excavations, revealing the wonderful fortress of 1,000 years ago. Seabourn Sojourn is docked across Haifa Bay, ready to see sail this evening across the Mediterranean, to Rome. We all know how it feels to hang out for a month until you get it, yes? Mezze of 12 fresh salads, and the best felafel, precedes the succulent minced lamb kebab – charred to perfection on large skewers. I haven’t enjoyed a meal like this since I can remember! Waking to the blush of dawn and birds singing, I lay here wishing for another half an hour before starting the day. It’s not yet six o’clock. 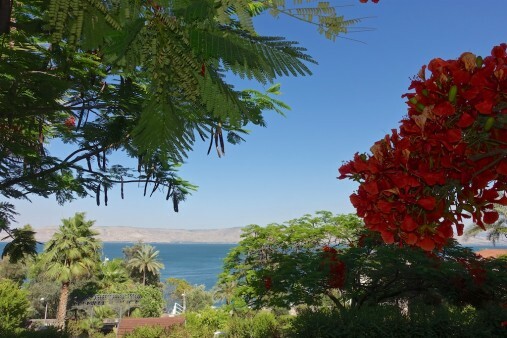 As for the many who have trodden this path around the Sea of Galilee before me ‘wondering’ what Jesus may have been doing at various times of the day in his three years of ministry, thankfully, I am alone. And it’s springtime. And, it’s not dusty. The Doctor's Residence of the old Scot's Hospital on the left and The Manse on the right - at sunrise! I heard a pastor ‘droning-on’ to a table of rapt twenty-somethings in the dining room last night about the dove and the spirit, and I thought; “Gee, I’m glad that I have this mini-pilgrimage to myself”. We all know the stories. I certainly don’t need to hear them simplified any further. Throw in a bit of singing and you might interest me. But I couldn’t be travelling for days on end with ‘holy-joes’. The blooming poinciana around my hotel are a distraction to the beautiful sunrise. But, aren’t I lucky to have such a setting? I’m staying in what used to be the Doctor’s House in the old 19th century hospital in Tiberias. The Church of Scotland took it over and converted it into the Scots Hotel in 1999. I have a spring in my step ready to continue the day – driving around the Capernaum and dropping in on other of the Christian sites. Across the other side of the Sea of Galilee is Syria, and an hour north is Lebanon. Jordan is to the east. I pray this day for those poor people, and for family and friends. 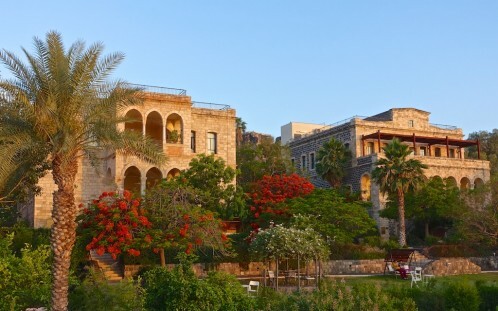 Settling into the Doctor’s House at the Scots Hotel overlooking the Sea of Galilee. Hot apple juice with a swig of Glenfiddich at check-in sets me in the right frame of mind to enjoy the evening. A clear sunny afternoon doesn’t get in the way either. All’s well. Since leaving the ship in Ashdod Port this morning, I’ve had a chance to visit the Church of the Annunciation in Nazareth, and on to Cana to see one of the six stone jars into which Jesus changed water into wine at the Marriage Feast – located in the crypt of the Franciscan Church. 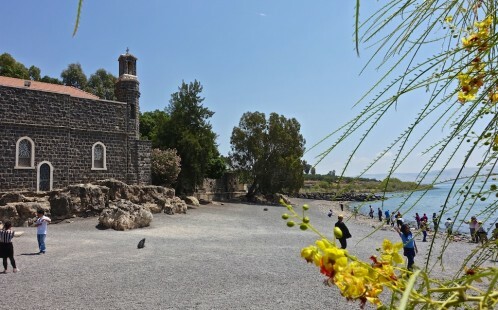 Tomorrow we go to Capernaum before visiting the Golan Heights. 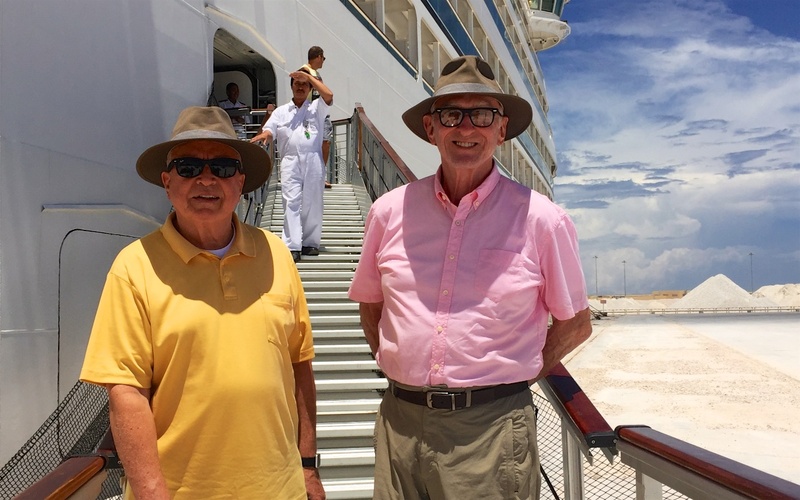 And then back to the ship in Haifa for the cruise across to Rome, ‘non-stop’ for three days. There’s such a marked contrast between Nazareth and Tiberias. 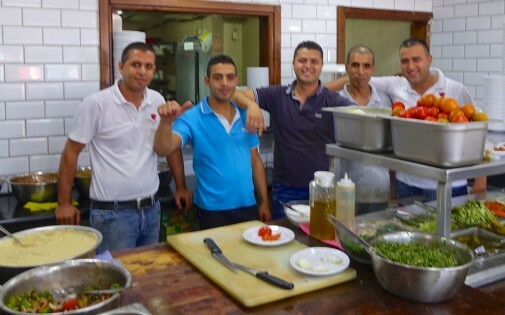 There are more Arab Moslems in Nazareth today than Christians and it doesn’t have the shine of an Israeli city. Tiberias, on the other hand is welcoming, tree-lined and tidy. For centuries after the destruction of the Second Temple in 70AD, Romans and Byzantines forbad the Jews to live in Jerusalem. So the Jewish people migrated to Galilee here in the north and made Tiberias their spiritual centre. Only at the time of the Moslem Conquest in 635AD that the Jews were allowed back into Jerusalem. How things have changed! 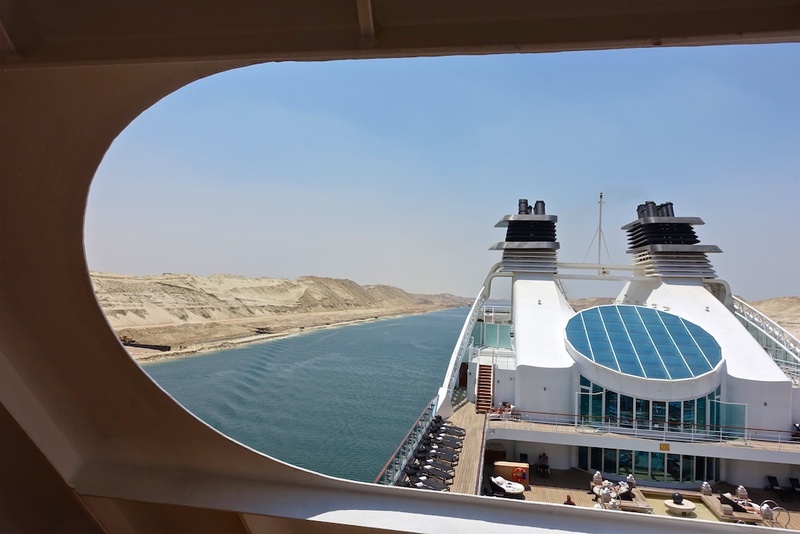 fter transititing the Suez Canal in daylight hours, we exit into the Mediterranean at Port Said and head north to Ashdod Port in Israel; temperature has dropped almost twenty degrees from our days in the Red Sea; pleasant enough for Bloody Marys and lunch on deck by the pool for the first time. A week to go, now under Mediterranean skies; like a new day dawning; feels like the start of a new vacation with a host of different opportunities for enjoying the holiday. 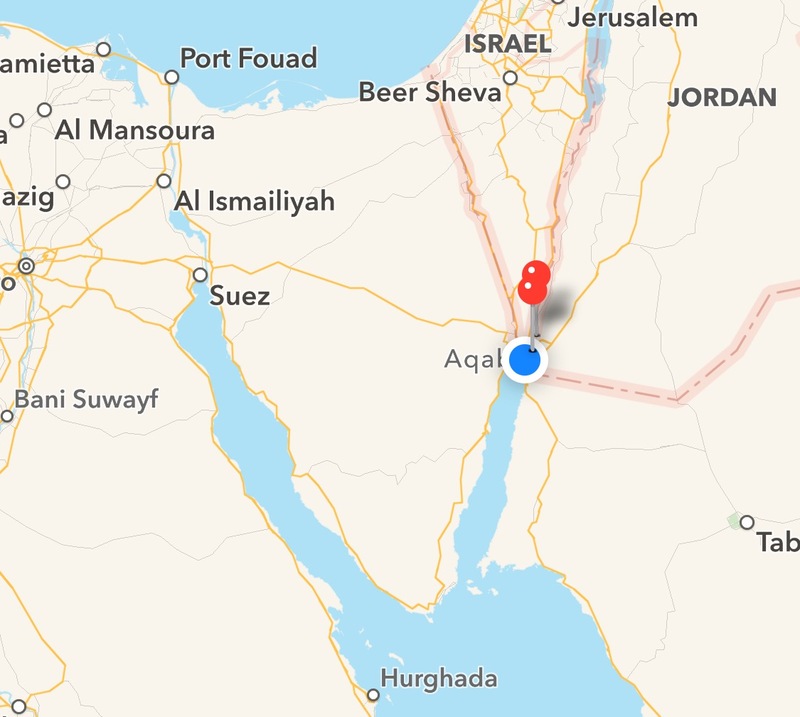 ow did Moses part the waters of the Red Sea – eighty metres deep here! We are at the head of the Red Sea – sailing in the Gulf of Suez today, after coming out of the Gulf of Aqaba and around the Sinai Peninsula last night. 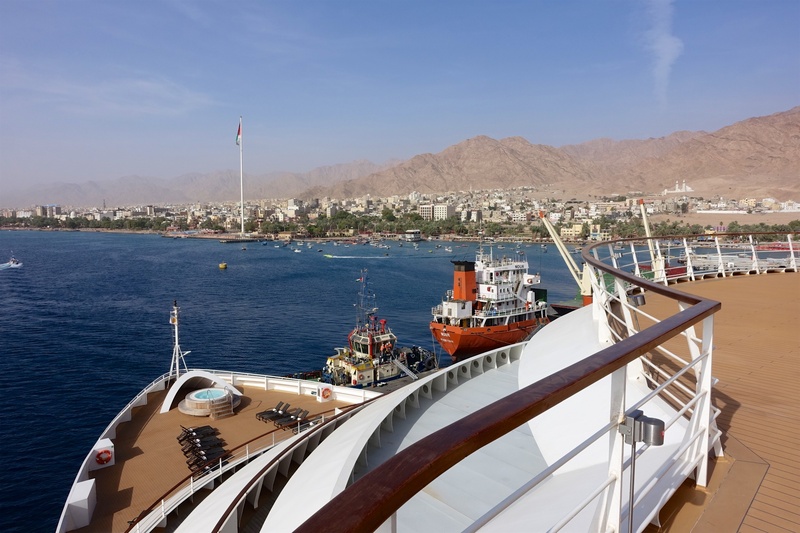 Reaching Port Suez, we need to drop anchor by 11pm, and then jostle for a place in the convoy through the Suez Canal tomorrow. This passage through the Suez Canal brings welcome changes in the style of our cruising holiday. 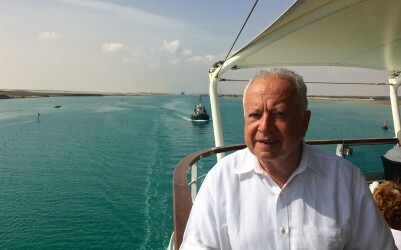 The forecast of 35 degrees for Port Suez, becomes 22 degrees in Port Said – heralding a much more amenable Mediterranean climate. 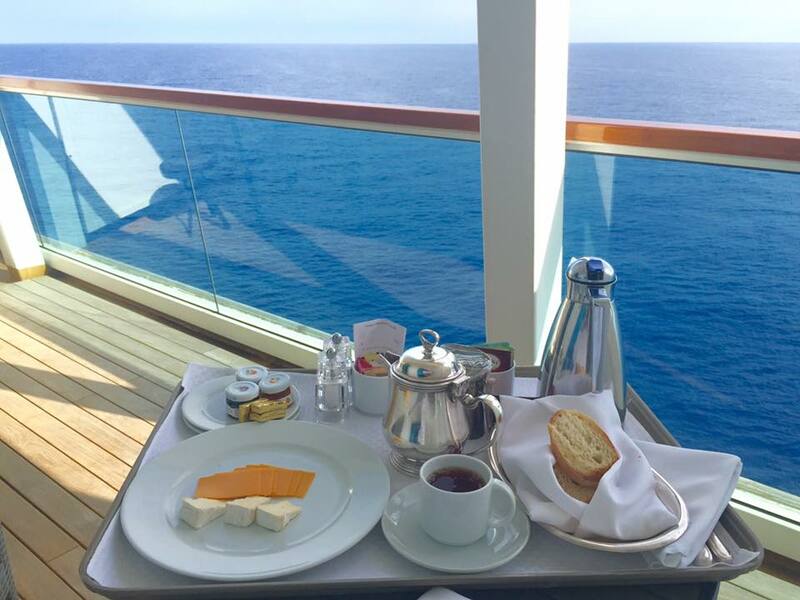 I can look forward to dining more under the stars on deck!